Train students from various backgrounds to address real data science needs in the business world. Use JMP® in the classroom to introduce students to statistical principles while also familiarizing them with a tool used widely by industry partners. OSU continues to achieve strong post-graduation job placement year after year. With a robust and balanced statistical and business education, graduates of OSU’s Master of Science in Business Analytics program are ready to hit the ground running in industry careers. In America’s heartland at Oklahoma State University, a unique graduate program at the intersection of marketing and data science has trained more than 900 students for the growing field of business analytics. Created by Goutam Chakraborty (or Dr. C as he is known to his students), SAS Professor of Marketing Analytics at OSU’s Spear School of Business and Director of the program, this interdisciplinary degree has enabled students from an array of backgrounds to build on their established industry skills with in-depth statistical training and applied business principles. What started as a Data Mining Certificate in partnership with SAS is now a fully accredited Master of Science in Business Analytics (MSBAN) with three additional certificates jointly awarded by OSU and SAS (predictive analytics, data science and the original certificate in data mining). Growing up in a refugee colony in India, Dr. C came a long way to arrive at his current role. “In India at that time, you become an engineer, or you become a doctor, or you become an accountant,” he says. “So I became an engineer because that was my inclination at the time.” After working as a mechanical engineer for two years post-graduation, Dr. C began to feel a restlessness that would become familiar throughout his career. “I was a mechanical engineer, worked for a while, got bored. That's a trend in my life – I get bored,” he admits. Subsequently, he worked in management and marketing while getting an executive MBA, but after completing his degree and continuing his ascent up the management ladder, Chakraborty once again sought a new challenge, this time in the United States. But a twist of fate brought him to his current path in academia. “I applied to 10 schools for an MBA and by accident, the University of Iowa sent me a PhD form ... so I filled it in.” Once he completed his PhD in marketing and simultaneously an MS in applied statistics, Dr. C joined OSU and has been there ever since. "JMP is already in the industry, so if I produce students who already have JMP skills [by the time they begin their career], they can hit the ground running. Employers don't have to teach them JMP. They already know it." 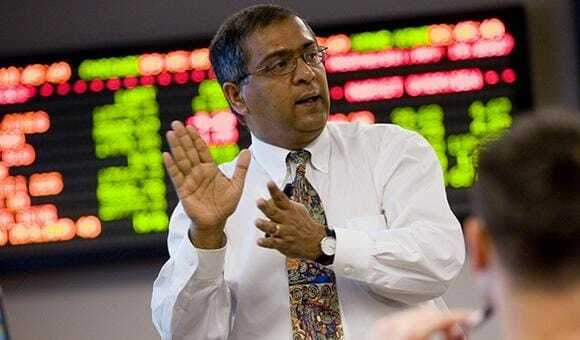 With both a marketing and statistics background, Chakraborty taught many courses in applied marketing research and statistics, but he recognized a need in the marketplace for graduates with a more focused, yet business-friendly, set of skills. “At that point in time, there was no such thing as an analytics program, and SAS was just starting to really push the frontier on data mining,” he says. Dr. C initially began with a certificate because it was simpler and faster to implement than a full degree program. But a comprehensive master’s program was always his true goal, especially as the buzz around everything “data science” grew. After a few years working to develop such a program, he finally began enrolling MSBAN students at the end of 2014. "The students are happy because they get jobs," Chakraborty explains. In the MSBAN program, all students receive paid summer internships and job placement rates post-graduation are high; over 90 percent within three months from graduation in 2017, for example. Internships are another crucial piece of OSU’s graduate program. “We can talk about projects all day long and we can do projects with real data, but it’s not the same as working for a company. It’s never really just the data or just the model or the analytics,” explains Dr. C. “I want to [foster graduates] who can solve business problems using whatever data technology process tools are available. I want [my students] to sit at the table with you and be able to explain the model he or she has built.” And with the simple interface and dynamic visualization tools that JMP offers, Chakraborty says students can focus more on developing their understanding of underlying principles instead of wasting time and energy trying to figure out how to use a more complex program. Students from the OSU MSBAN program present a poster on predictive modeling at the 2017 JMP Discovery Summit in St. Louis. 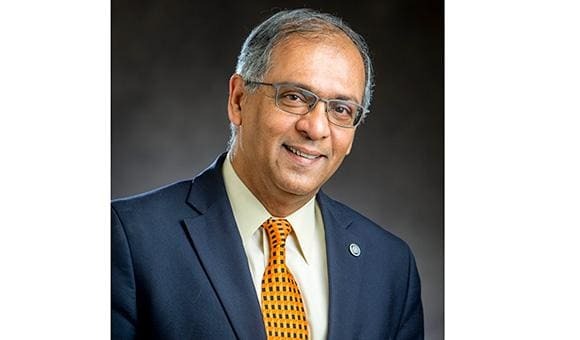 Chakraborty, who will chair SAS Global Forum 2018 in Denver, also served on the Steering Committee of JMP Discovery Summit for three years running. 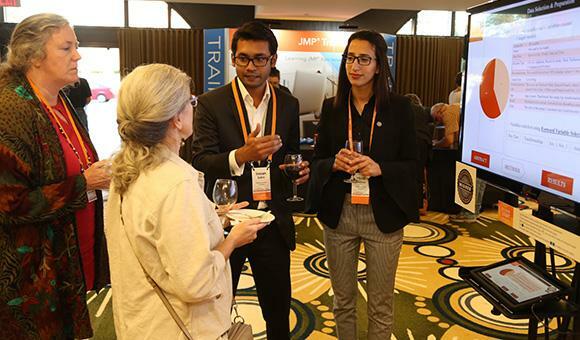 Conferences like Discovery and SAS Global Forum, he says, provide an excellent opportunity to foster fruitful industry partnerships: “At conferences, I hear from companies what they’re looking for [in job candidates]. The second advantage is, I’ve been around for a long time.” Having been a pioneer in the intersection of marketing and data science as it pertains to the business world, Chakraborty is well known by a wide cross-section of business leaders, and he uses these relationships to keep abreast of developing needs and trends.